Returning clients Larry and Jim and Larry brought along his son Jeff. After setting the rods and a little instruction on what to do when we get a fish on. The starboard side rod was slammed and Jeff grabbed the rod and as it neared the net, Jeff slowed down on the reeling and the fish came undone. Two other strikes on the day, finally, Jim landed one and we only need one more fish and the day was nearing the end when on the last pass one of the back rods doubled over hard and Jeff grabbed the rod and after a great fight the fish was in the net and we had limits for everyone onboard. A great day with great people. Thanks again guys!! 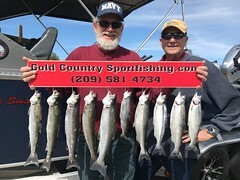 Returning clients Mark Largent and Mark George were onboard to hunt down king salmon. After setting out our rods it wasn’t ten minutes and the port side rod was hit but not very hard, however when it came close to boat we could see how small it was and when it got off I was glad. Continuing on the same rod went down again and we landed a quality king, then about and hour later into the run we landed another quality salmon. Then things slowed down somewhat. In the after noon I made some changes and we had three fish on in a 100 yard stretch and I landed the third fish of the day. A great day with two great guys!!!!!!!!!!!!!!!!! Returning client Joel and his two young boys were onboard with me again this time to chase king salmon. We set out and headed down stream and after setting four rods we were on our way. After going a half mile one of the back rods went down I grabbed the rod and handed it off to Mason, I could tell this was a big fish and it was a hot one as it took a 100 feet of line in seconds, we cleared the other rods while he was fighting this fish I could tell the fish was getting the upper hand on Mason but he was gaining line and the fish was in sight then he went to the other side of the boat again we could see the big fish, now the fish was heading for the back motors, so I gunned the kicker motor to separate the fish from the boat and the fish actually hit the prop while it was running and chopped the lined. On the same pass we finally landed one. The second pass another rod went down and this time Joel was fighting a fish and as it neared the boat and very close to the net the fish started violently shaking his head back and forth and broke the line off with his teeth. That was it for the day. Thanks again for coming out guys!!! Returning clients Mitch and Dan and new clients Steve and Merle were onboard on this day to chase king salmon. The four guys got along great and after setting the four rods I told everyone you can take turns or pick a rod is was up to them. So Dan picked his rod and the others just said they would take the rod where they were sitting, and ten minutes into the trip the starboard side started pulsing violently and Mitch grabbed the rod and the fight was on and very soon after the bright king salmon was in the net. This would be it for sometime and after many passes we finally had a great take down, but it didn’t stick, Then finally the starboard side rod again went down and Steve grabbed the rod and somehow the fish became tangled with another rod and I thought we were doomed, however I coached Steve and Dan and I was able to net the salmon. It was getting late in the day, but I really wanted another fish so we made another pass and this time we had another very hard take down where the rod pulsed three times on one of the back rods and just as Merle was getting close to the rod the fish let go. That was it for the day. A great day with a group of guys. Thanks again !!!!!!!!!!!!!!!!!!!!!!!!!! 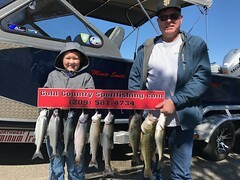 Returning client Kim brought along his son for an early birthday gift in hopes of catching a king salmon. I also invited Bill Karr from Western Outdoor News along to do an on the spot. We all met up launched the boat and headed out, after setting our four rods I always tell people what to expect when a fish is hooked up. Well we were moving along when all of a sudden the port side rod was slammed violently, but he missed the hook! We continued on and the same again what I thought was hitting the bottom, so Bill reeled the rod a couple of times, well it was a bite and the fish came back again and buried the rod in the holder, we all cleared the rods and this fish was BIG, while Ryan was fighting the fish we finally got a good look at the fish and after some good runs that just burnt line off the reel, I netted a 24 pound king salmon!!! After some high fives and photos we continued on and not even 75 yards the same rod again was hammered just as hard and Kim was up on the reel and again some great runs were had and a 21 pounder was in the net. High fives and photos were on again. I set the rods out again and this time 50 yards when the back rod was hammered, so I grabbed the rod out of the holder and handed it off to Bill, this fish gave him a great fight and a 15 pound 10 ounce king salmon was onboard. A great story for Bill and a great trip for a father and son. Thanks again!!!!!!!!!!!!! 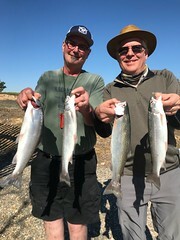 Returning client Steve brought along two of his good friends for a trip on the Sacramento River. We launched the boat and headed out after setting the four rods we were on our way and after a little explain on what to do when we get a fish on I looked over at the port side and his was pulsing hard so Trevor grabbed the rod while the rest of cleared the rods and after a good battle we had our first fish of the day in the net. We continued on and maybe 100 yards another hard grab and this one made it half way to the boat before it came off, after resetting the rods a while downstream we had a back get hammered three times, however the hook never stuck, however the next fish wouldn’t come off for Zach as he boated a nice chrome salmon. We pulled our gear and headed back up-stream for another pass, as time went on with nothing going on we had another hard strike that came up empty nearing the end of another pass the port side rod went down and this time Steve grabbed the rod and we boated our third fish of the day. We called it a day and headed for the ramp. Another great day with three great guys. Thanks again guys!!!!!!!!!!!!!!! Returning clients Mike and Chris were back for another trip me, this time on the Sacramento river to hopefully catch a king salmon. The morning was cool with no wind, so after arriving at our location on the river I set out four rods and off we go after seeing a couple of boats have a fish already I was hoping we would be as lucky and with in 150 yards the starboard side back rod was violently pulsing, Mike grabbed the rod and after a short fight we put a nice fresh king salmon in the boat, instead of heading back up-stream we continued on and within a 100 yards the starboard side rod was slammed and Chris grabbed the rod and was fighting the fish and for some reason almost to the net the fish came off, so after resetting the rods another 100 yards and the same rod again went down and this fish put a great fight and after many minutes we put this fish in the net. We continued on and we had a few more hard strikes but we were unable to catch my fish. Still a great day with great guys. Thanks again!! !